After the war, Oldmobile’s chief engineer Jack Wolfram putting a team together to develop a modern, short-stroke, OHV V-8 engine – something entirely new for Oldsmobile. The team went to GM’s Research center to check on Charles Kettering’s work on the same type of engines, and came away inspired as to the inherent advantages. The first effort was a 288 cid V-8 which GM executives axed due to Cadillac executives’ insistence that their upcoming high-compression overhead valve V-8 shouldn’t have internal competition. 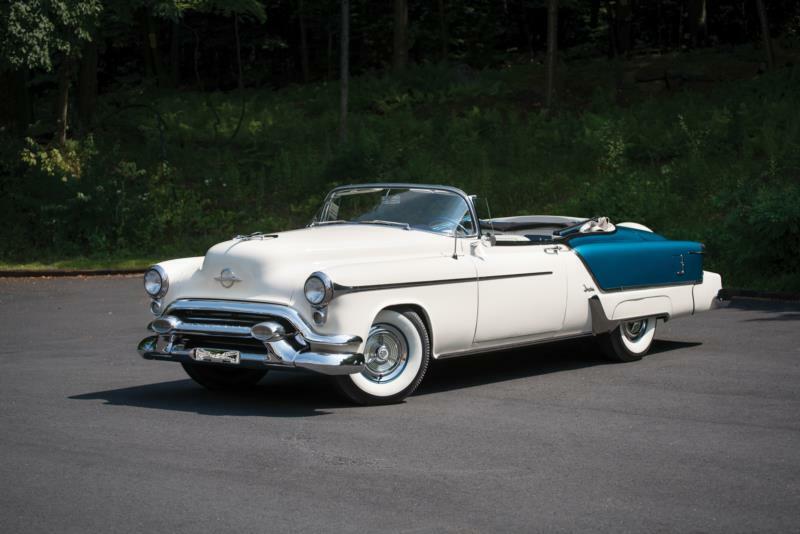 In the end, Oldsmobile was given permission to renew development and monies to tool up for their own engine, though the initial displacement of 303 cid was close enough to Cadillac’s effort that their engine was increased from 309 to 331 cid prior to introduction, also in 1949. Many, if not most of these Olds 98’s were ordered with Hydramatic automatic transmissions. The 1948 L-head inline eight cylinder Oldsmobile engine of 257 cubic inches and 115 horsepower was therefore duly replaced for the 1949 model year with a powerhouse of 135 horsepower, transforming performance. The new V8 was initially only offered on the Oldsmobile 98. Olds 98 sales fairly leapt ahead, increasing year-on-year by over 43 percent. Olds also had a new “glamour car” in the 98 Holiday, a two-door pillarless (hardtop) coupe, arriving alongside sister (GM) C-Bodied Buick Riviera and Cadillac Coupe de Ville, all from the capable styling studios of Harley Earl. Oldsmobile got the nod for Indy 500 Pace Car duty in 1949, and some of the NASCAR teams, tempted by the new Rocket V-8, even ran Oldsmobiles. By 1950, new sales records were being set and Oldsmobile moved up from 7th to 6th place in the sales race, with over 400,000 cars sold. Race results throughout the year continued to show the Rocket engine in favorable light with wins in the Carrera Panamaerica in Mexico, NASCAR grand national races, and records on Daytona Beach. Not much changed for 1951, as the Korean War hampered Detroit’s ability to improve and change their cars that year. For 1952, the Rocket V8 did not increase in displacement, but a new four-barrel carburetor was introduced, as well as an increase in compression ratio. This allowed the 98 engine to produce up to 160 horsepower, a significant increase. Bodies were altered with a 2-inch longer wheelbase, now 124 inches total, and styling was improved. Another new popular option was GM’s Saginaw power steering. The 1953 cars saw the engine improved a little more, with even higher compression for 165 horsepower. Oldsmobile was one of the first US auto companies to switch from 6 to 12 volt electrics for 1953. In addition, Bendix power brakes and Frigidaire air conditioning could be ordered on the Olds 98 for the first time. A fire at GM’s huge Hydramatic transmission factory in meant that no transmissions were available for five producers of automobiles, including Oldsmobile, resulting in the loss of up to 300,000 units produced and sold. GM reacted with extreme speed and a few late 1953 Oldsmobiles were equipped with Buick-supplied Dynaflow automatic transmissions until a makeshift factory could start turning out Hydramatics again. 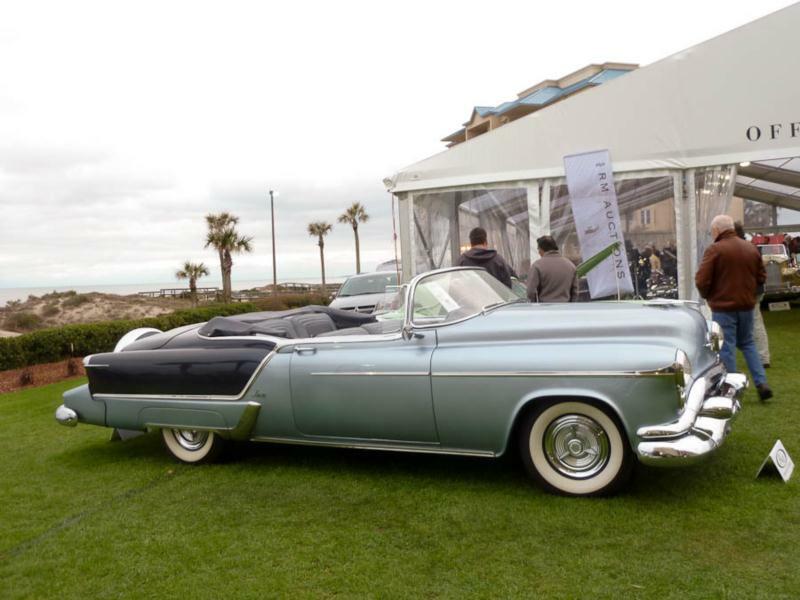 The 1953 “Ninety-Eight Fiesta” two door convertible (with all options included, as well as special wrap-around Panoramic windshield) joined other GM “specials” including the Chevrolet Corvette, Buick Skylark and Cadillac Series 62 Eldorado. Styling similar to the cars seen on GM’s Motorama show circuit predicted the upcoming new 1954 look, with two-tone leather upholstery standard on the Fiesta. Only 458 were built, mostly because they were priced at a then eye-popping $5,717, against the base price of the 98 convertible’s $3,229.